Preheat the oven to 220°C, gas mark 7. Peel and dice the potatoes, and cook in boiling water for 15-20 minutes until tender, then drain. Meanwhile, cook the fish fingers and peas, according to pack instructions. Mash the potato with the mayonnaise, onions and horseradish sauce. 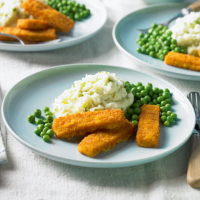 Season well and serve with the fish fingers and peas.